We go coast-to-coast for baseline-to-baseline coverage of the NCAA men's basketball as it happens from Selection Sunday through the NCAA Championship game. Back and forth right now. One point lead for Texas, 82-81 over Arizona State. 1:40 to go in regulation. Preach! RT @JohnGasaway : Death to live-ball bench timeouts. Tie game on CBS, after Jemaine Marshall's three-pointer. 2:56 to play. MOAR RT @CBSSports Texas leads Arizona State 80-76 with 3:29 left. Watch the ending on CBS or online: cbsprt.co/ASUTEXAS. Texas lead is down to 1 with 5:20 to play. Texas vs Arizona State on CBS: Six leads changes in this game. Largest lead was Texas by 14. 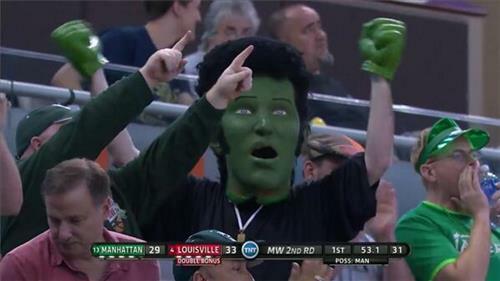 Louisville up 6 on Manhattan at halftime. Texas up 4 on Ariz State under 8 mins to play. It’s getting interesting in Milwaukee. 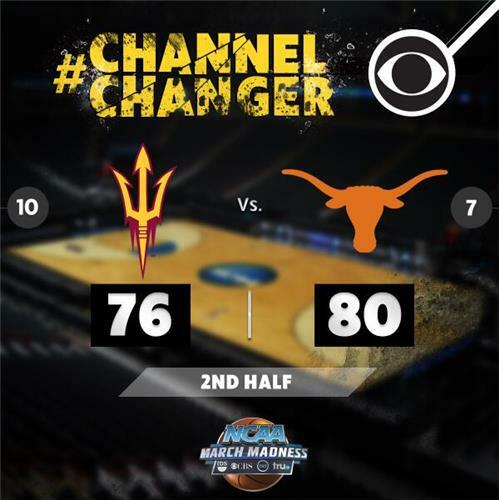 Texas 66, Arizona State 64 on CBS. Texas leads Arizona State 61-49. 11:42 to go in the game on CBS. #UofL vs. #GoJaspers is underway NOW on TNT! Is anyone else having troubling handling all of the madness? You're not tired, are you? Villanova is down 5 late first half.